An American woman residing in Sicily for the past twenty years portrays the Sicilian landscape and customs--both rural and urban--from the perspectives of both a "foreigner" and a resident. Mary Taylor Simeti is an American expert in Sicilian medieval and culinary history. 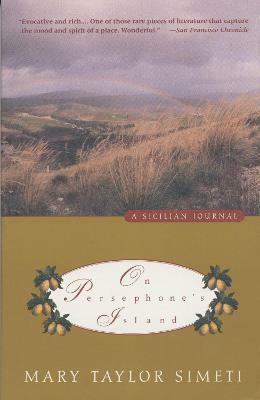 Simeti's book, On Persephone's Island: A Sicilian Journal, chronicles a year on Sicily, the Mediterranean island that she called her permanent home after visiting for a year. Her other books include Pomp and Sustenance: Twenty-five Centuries of Sicilian Food, Sicilian Food: Recipes from Italy's Abundant Isle and more. She has also contributed numerous articles on Sicily to the New York Times' travel section.